The 'perfect plaything' is the latest variant of the stunning GT sports coupe. 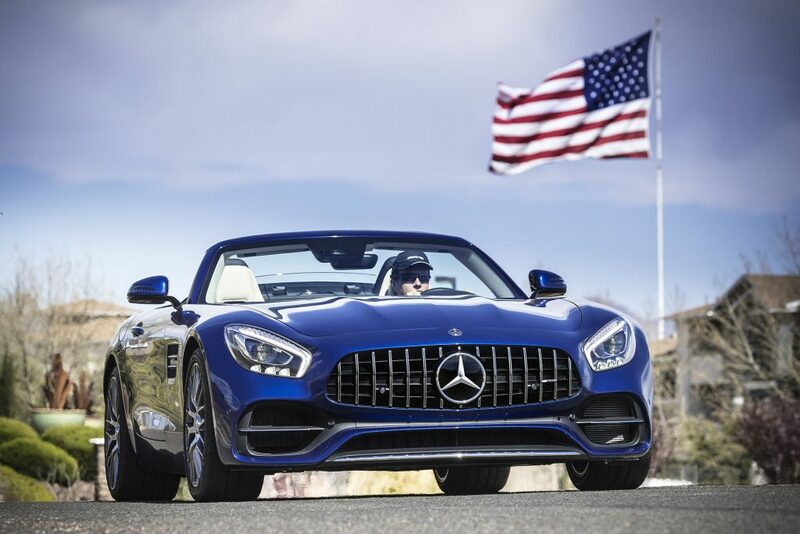 The 2018 Mercedes-AMG GT Roadster. If the Memorial Day weekend just past signals anything, it’s the beginning of travel season, a time of year when a vehicle’s load capacity is challenged by lifestyle debris and a driver’s temperament is tested by fighting offspring, a nagging spouse and clogged arteries. That’s the reality. The dream differs. The Roadster "channels Mercedes-Benz's racing heritage." In a perfect world, there’s just you and your special someone, motoring down an idyllic, traffic-free country road filled twists and turns and void of police officers. It’s the beginning of the pleasure driving season, a time when the temperature goes up and the tops go down, when flexing an automobile’s athleticism on the perfect road is the prime concern. So, as long we’re dreaming, why not dream of the perfect weekend plaything? It’s the 2018 Mercedes-AMG GT Roadster, the latest variant of the stunning Mercedes-AMG GT sports coupe, which debuted in September 2014. Like that sinewy sleek slab of Teutonic muscle, its newly introduced soft-top siblings channel Mercedes-Benz’s racing heritage, eliciting memories of the 300 SLR from 1952 and the Silver Arrow racecars of the 1930s. In its form language, this stunning machine brings those cars forward to modern times, its grille owing more than a little to the one used on the 1952 300SL Panamericana. This also explains why the engine isn’t placed in the middle of the car, just behind the driver, nor in the rear of the car, as in a Porsche. Instead, you’ll find a V-8 nestled up front under the car’s mammoth prow and broad shoulders, resting just behind the front axle. As with other iterations of the GT, the 4.0-liter twin-turbocharged engine channels its muscle to the rear wheels through a seven-speed dual clutch transaxle located at the rear of the car. While this year’s base models and the higher-end GT C Roadster share that powerplant, the beefed-up version makes better use of it, producing 557 horsepower and 502 pound-feet of torque and reaching 60 mph in 3.7 seconds before topping out at 196 mph. The lesser models get by with a mere 469 horsepower and 465 foot-pounds of torque, maxing out at 188 mph. Connecting all that power to the pavement on the GT C Roadster are 265/35 R19 front tires and 305/30 R20 rear tires. The base model gets 255/35 R19 front tires and 295/35 R19 rear tires. Also, the GT C’s track is 2.24 inches wider. Any one of the options – for which base prices were not available – will fulfill your high-speed fantasies. The V-8 emits a noise that envelops your senses and quickens your heartbeat. And as you’d expect, there’s no real turbo lag, just gobs of power. Although light on-center, the car’s hydraulic power steering proves to be precise, quick and brimming with feedback, if a bit darty. The AMG displays remarkable grip in corners and flat cornering behavior that allows you to steer it using your right foot. Kudos should go to the seven-speed dual-clutch transmission, which shifts so quickly, you’ll rarely use the paddle shifters mounted on the steering wheel. All that said, the performance many folks will be most focused on is that of the three-layer soft-top, which raises and lowers in less than 11 seconds at speeds up to 31 mph. It’s available in black, red and beige to match the 11 exterior and 10 interior colors that are available. Speaking of the interior, it’s little different from that of its fixed-top brethren. The firm seats feature prominent side bolsters to hold you in place, something you’ll appreciate as you put this car through its paces. They’re separated by an unusually large center console that’s lined by eight random controls. A large palm rest and scroll wheel activate the infotainment system, and their placement just aft of the giant cup holders pushes the stubby transmission lever far back on the center console. As in the Coupe, the Roadster is meant for those who travel light, with minimal cabin storage and a trunk that accommodates a duffle bag or two. But in our dreams, such practical matters fade, like the road already travelled. 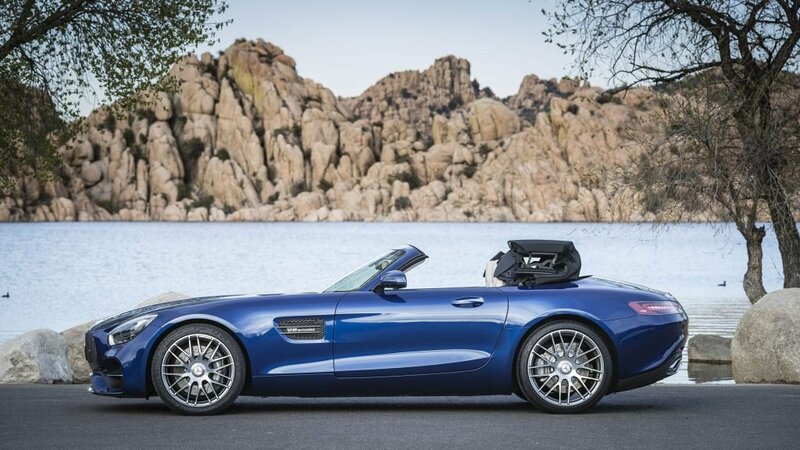 The 2018 Mercedes-AMG GT Roadster is a reward for a life well lived, an extravagant gesture of leather, aluminum, power and lust wrapped in expectations of the next great apex. It’s one of tomorrow’s collectible automobiles being built today, and it’s simply spectacular.